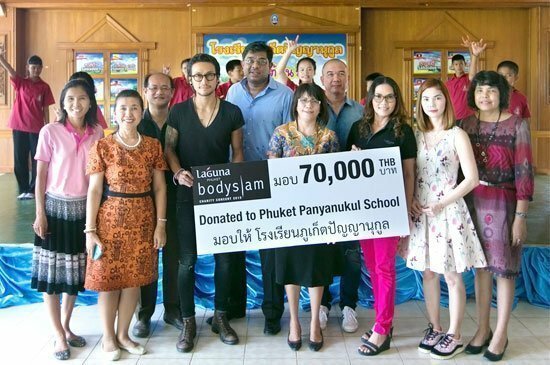 Tuesday 22 September, a month after five thousand fans crowded the sold-out “Laguna Phuket presents Bodyslam Concert 2015” at Laguna Grove, the resort’s outdoor large-scale event venue, Laguna Phuket revisited Phuket Panyanukul School for children with disabilities and presented donation raised from the Concert. Laguna Phuket has supported the school since 2007, then donated a whopping THB 1.5 million to support the construction of skill development playground, an infrastructure required to improve the students’ learning ability. “Wonderful schools like Phuket Punyanukul are our society’s way of giving these children a place to thrive upon” he concluded. Laguna Phuket’s contribution in the total amount of THB 70,000, from part of the ticket sales, donation and fund raised at the Concert plus Laguna Phuket Foundation (LPF)’s THB 20,000 contribution, was sufficient to refurbish a locker room and install proper storage cabinets, lockers and shelves much needed for students’ dormitory at Phuket Punyanukul School as planned. Mr. Ravi Chandran and Khun Toon took a group photo with students of Phuket Punyanukul School who just performed a sign language in sync with a Bodyslam’s song on stage. Much to the school’s astonishment, the band’s vocalist “Khun Toon” made his surprise appearance to interact with the school children and also add THB 40,000 donation to the pool; THB 30,000 from his pocket and THB 10,000 from an auction placed by Mr. Chaichana Keowkaow for the shoes he wore on stage. With the total donation of THB 110,000, the school is now confident they can build two, instead of one, locker rooms at two school dormitories. “Thank you all very much for the kind support. We are doing our best to ensure all the school facilities properly contribute to physical ability rehabilitation and health and nutrition programmes designed to improve our students’ ability to adapt and be self-dependent in the future,” said Ms. Supanna Keawpermpoon, the School’s Director.